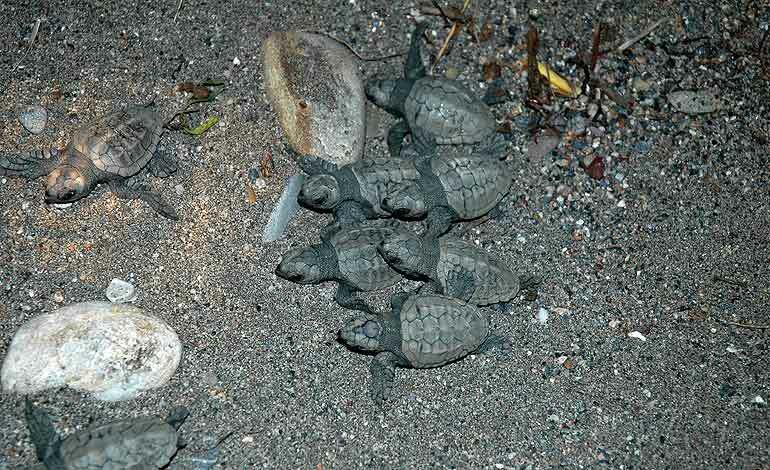 40 eggs of loggerhead turtles (tortuga boba – Caretta caretta) hatched last week on a beach in Cabo de Gata, Almeria. Another 40 are expected to hatch these days. The eggs came from Cabo Verde and form part of a reintroduction programme of the Junta de Andalucía and CSIC. The aim is for the same turtles to return to lay their eggs on the same beach, though the high mortality of the species means that very few if any of these young hatched in Almeria will reach adulthood.1000 eggs were taken from Cabo Verde, where a third of the world’s population lives. 800 were left in the Canary Islands and 200 were brought to Andalucia. 120 have been raised in incubators in Sevilla. Small populations of loggerhead turtle in the Mediterranean exist in the Turkey and Greece.